What if you could have the best of all worlds? Benefit from open access to the resources of a wide and deep global knowledge base and the growing data volumes that drive it. 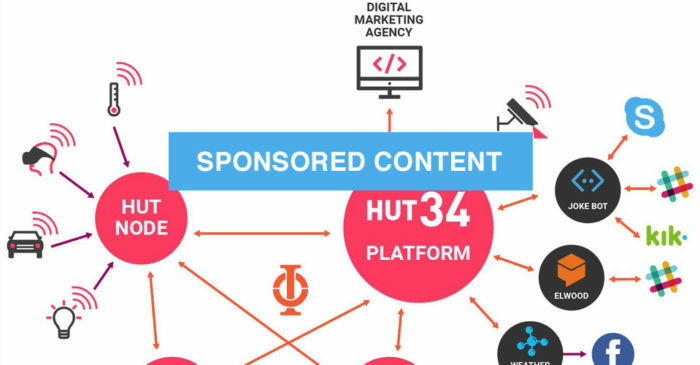 Introducing the Hut34 Project – building a world first open, platform agnostic network allowing ‘Chatbots’, IoT devices, and other digital services to communicate, share and monetise their data transactions. One of the fastest growing trends in AI is automated chatbots, mechanised assistants and content platforms that work like a conversation to fulfill the queries of customers, users and peers. By 2020, Gartner Research thinks chatbots will power 85 percent of all customer interactions. Problematically, monetisation of this space remains tightly controlled by large corporates, and elusive for many smaller producers, who struggle to profit from their data, information or expertise. Tim McNamara System Architect of Hut34, puts this into perspective, “Imagine weather buff Alice builds her own chatbot that responds to its users queries about tomorrow’s forecast. She has lots of users but can’t figure out how to monetise her content. She meets Bob, who runs a chatbot that shares jokes. Bob’s already part of the Hut34 network where he earns Entropy tokens from his content. He sets the price his content gets when another Hut34 content provider uses it. “Charlie is a customer of Bob’s joke chatbot and uses it every day. One day he realises he’d like to know what the weather’s going to be like, so he asks Bob’s joke chatbot. Bob’s service doesn’t have weather data, so it sends a query across the Hut34 Network to find out. Alice’s weather chatbot, now part of the Network and the highest ranking content provider in her domain, answers Charlie’s question. “Bob’s chatbot pays Alice’s chatbot for the information. Bob’s happy because he’s still got Charlie’s attention. Charlie’s happy because he hasn’t had to leave the customer experience he enjoys in Bob’s joke chatbot. And Alice is happy because she earns tokens seamlessly from her content. Connection provides instant access to the user bases of all connected platforms and services e.g. Facebook, Skype, and Slack. Connection is simple and straightforward and can be done through operating your own network node (which we call “Huts”) or connecting to the Hut34 Platform. Route your queries into the Hut34 Network according to your needs. Use your Hut, our managed service or another 3rd party service to rank answers returned from the network to resolve your queries. Successful resolution adds utility and value to your service and end customer. Earn Entropy tokens by providing others access to your data, information or knowledge. Access a global network to deploy your expertise or marketing. Add utility to your existing service, making it more useful and again more valuable. Build on our layer – sell services that improve network features in exchange for Entropy Tokens. The time for an open. intelligent distributed and monetised data network like Hut34 is very much here. Accenture says the chatbot market will be worth US$1.86bn in 2020. McKinsey says the IoT market will be worth US$6.1tn by 2025, and PWC says AI will add US$15.7tn to the global economy by 2030.